Diversiton pocket Guides to World Faiths Did you know that the Bahá’í faith is the second most widespread of all world religions, currently found in as many as 253 countries worldwide? That the Baha’i faith is also the world’s youngest monotheistic faith? That Bahá’ís have no priests or ministers? That Bahá’ís believe that our economic problems are intrinsically linked to our spiritual problems? The 5 Minute Guide to the Bahá’í faith is the ideal starting-point for those wishing to learn more about one of the leading belief systems of the world. A succinct and highly accessible summary, this handy guide provides the perfect introduction to the essentials of the Bahá’í faith. 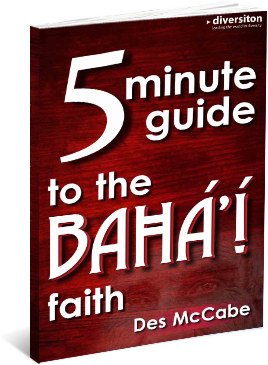 The 5 Minute Guide to the Bahá’í faith is one of a new series of pocket guides to world faiths. Each guide gives essential information on the history, traditions, beliefs and ways of worship in each faith. Update your knowledge with this great little refresher book – compact, easy to read and true to the essence of the Bahá’í tradition. Perfect for the workplace, college, school and at home. Start building your collection of the 5 Minute Guides to World Faiths – the most highly respected and trusted series of religion and belief ebooks available.